Fossil records enable a detailed reconstruction of our planet’s history and of the evolution of our species. But what kind of information can we obtain from the fossils of a fetus from almost 30,000 years ago? This has been investigated by a study recently published in the journal Scientific Reports and realized by Alessia Nava from ”Sapienza Università di Roma”, in collaboration with the Museum of Civilizations of Rome, Fermi Center, Elettra Sincrotrone Trieste (Lucia Mancini, Diego Dreossi e Franco Zanini), the Abdus Salam International Center for Theoretical Physics (ICTP), Università degli Studi di Bari and the University of Wollongong in Australia. Researchers have studied fossil records found in the “Ostuni 1” burial site, discovered in Santa Maria di Agnano in Puglia in 1991 by Donato Coppola (Università di Bari) and dated back over 27,000 years. More specifically, they became interested in the teeth of a fetus found in the pelvic area of the skeleton of a young girl. By analysing the still forming teeth of the baby, it has been possible to obtain information about the health condition of the mother during the last months of pregnancy, to establish the gestational age of the fetus, and also to identify some specificities of the embryonal development.For the first time, it has been possible to reconstruct life and death of an ancient fetus and, at the same time, to shed light on its mother's health. 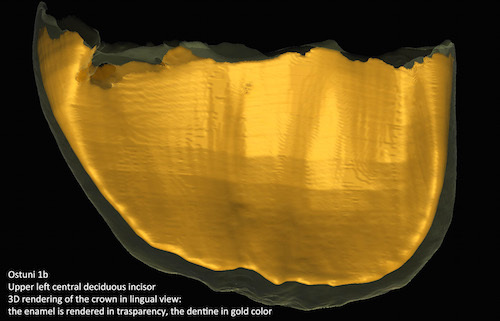 Dental enamel is a sort of biological archive that constantly tracks periods of good and bad health, while forming. Prenatal enamel, which grows during intrauterine life, reports the mother's history as well. 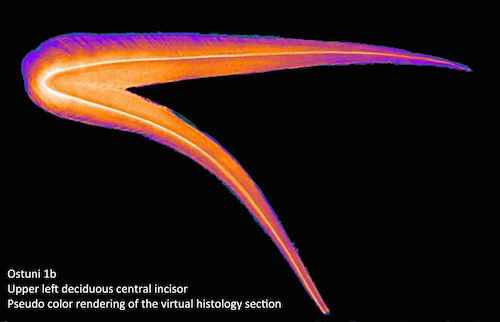 Three still-forming incisors, belonging to the fetus, have been visualized and analyzed by means of X-ray microtomography. The virtual histological analysis showed that the mother’s and baby's death occurred between the 31st and 33rd gestational weeks. Measurements also pointed out the occurrence of three severe physiological stresses that affected both individuals during the last two and a half months of pregnancy. This was highlighted by the presence of microscopic stress markers in the dental enamel, which are usually formed after stressful events as a consequence of an altered secretion. “Studies of ancient Romans already indicated an accelerated fetal development in the past,” Alessia Nava reports, adding “These results seem to confirm this trend in even more ancient times. We are now willing to extend our study; new surprises might await us.” Dental prenatal enamel in human populations of the past is the main research topic of a team of researchers, led by Alfredo Coppa and Luca Bondioli, at the “Sapienza Università di Roma” and at the Museum of Civilizations of Rome. In July 2017, the team had already shed light on the prenatal development of the ancient Romans. Now, using some of the most advanced technologies, they have given voice to the fetus of the young woman (known as "the oldest mother in the world") found in the Ostuni 1 burial.